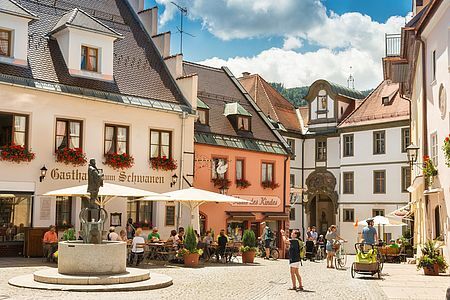 There can be no more beautiful conclusion to the Romantic Road than Füssen. The town, situated between mountains, lakes and the Lech, brings together everything that’s been encountered on the 413 kilometres between the Main and the Alps: impressive landscapes, fantastic hiking and cycling trails, a lively old town where 2000 years of history are reflected, a Medieval castle with unique illusionist paintings, countless places to stop for refreshments, an attractive location close to the Royal Castles, and much more. A fascinating finale!